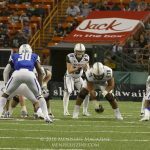 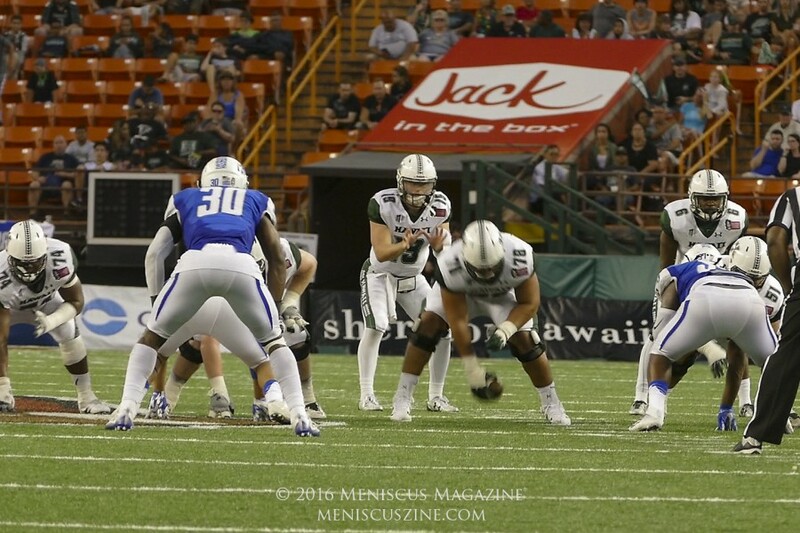 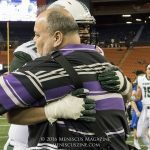 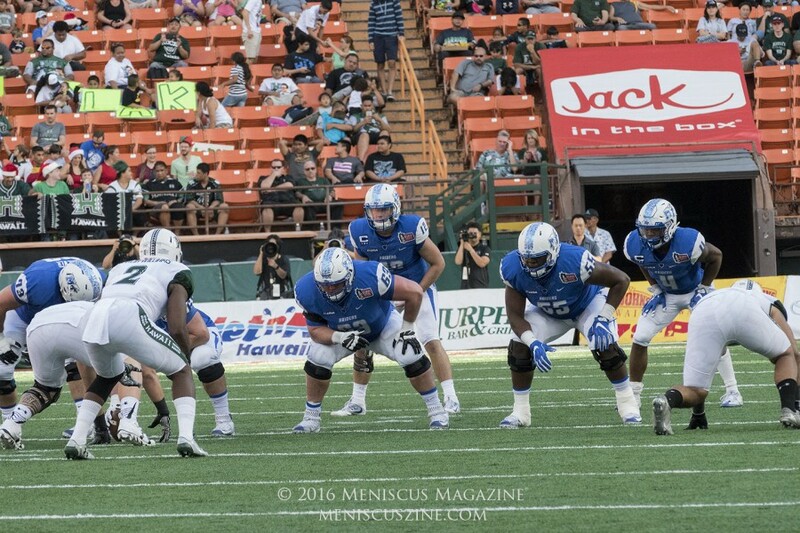 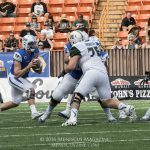 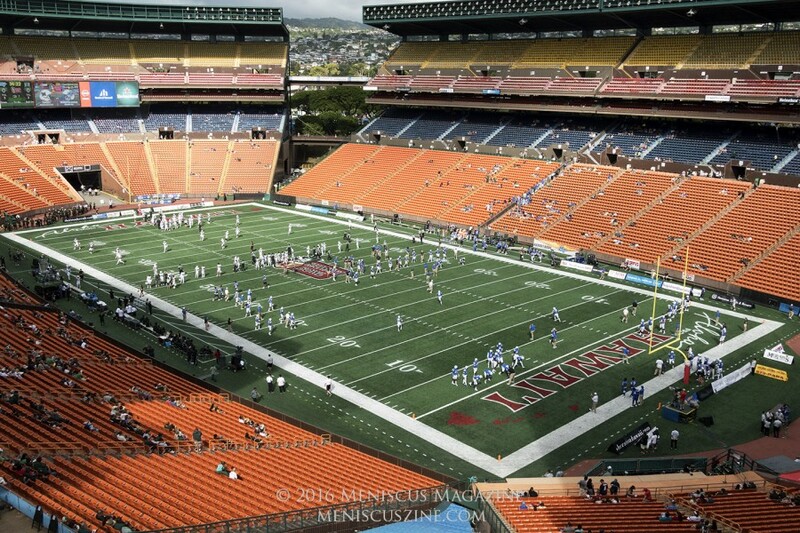 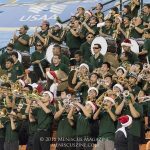 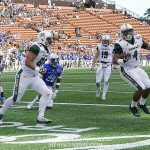 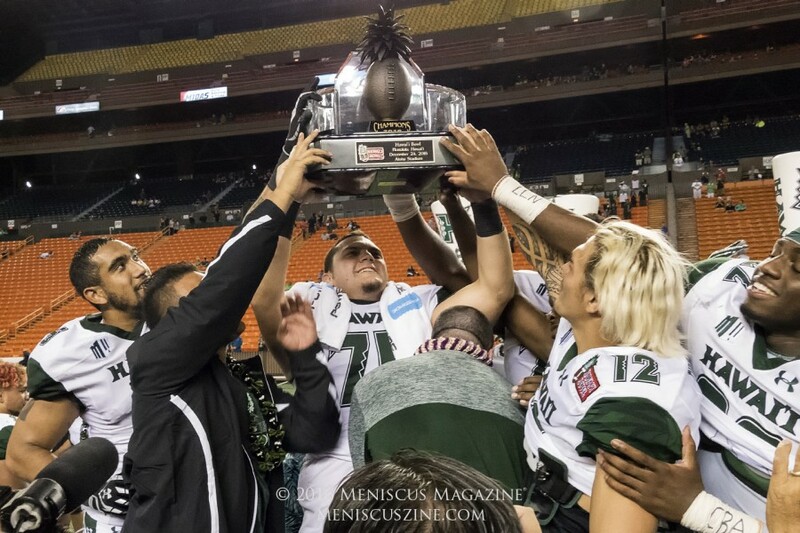 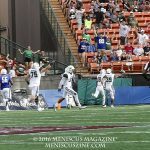 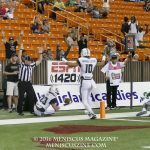 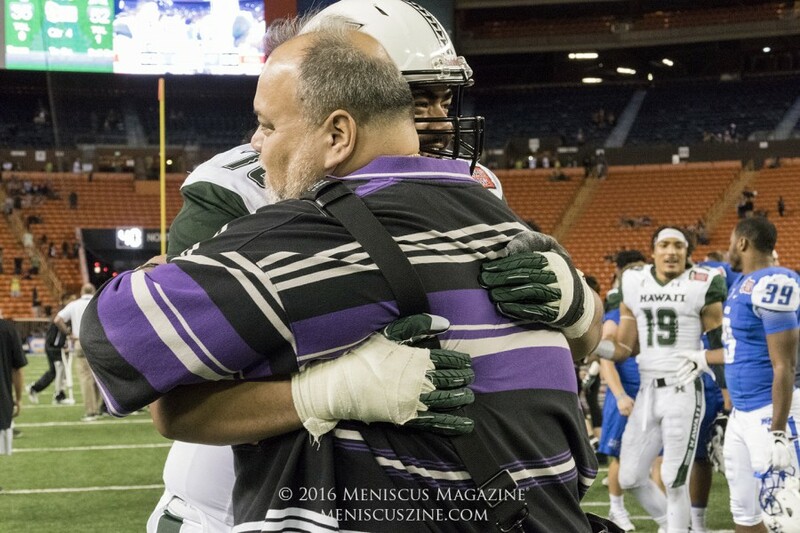 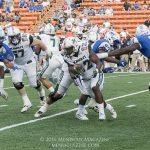 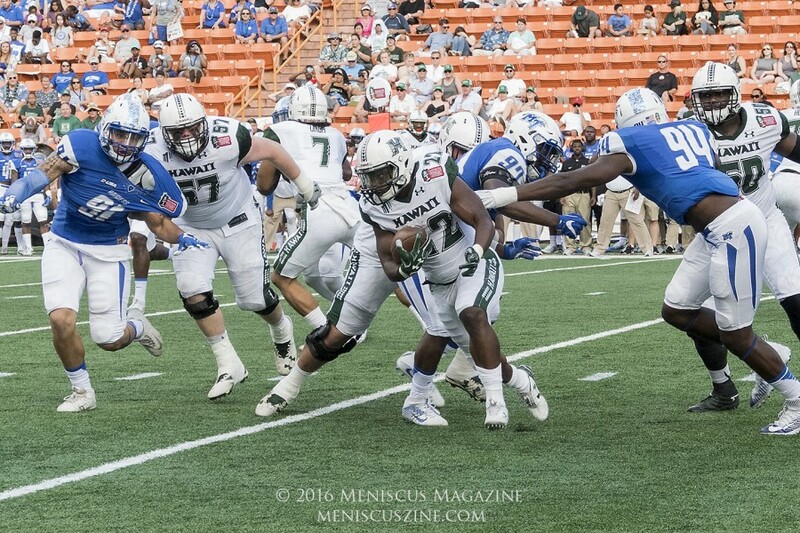 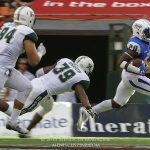 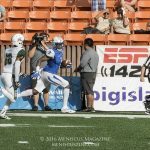 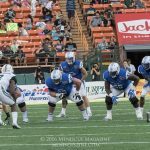 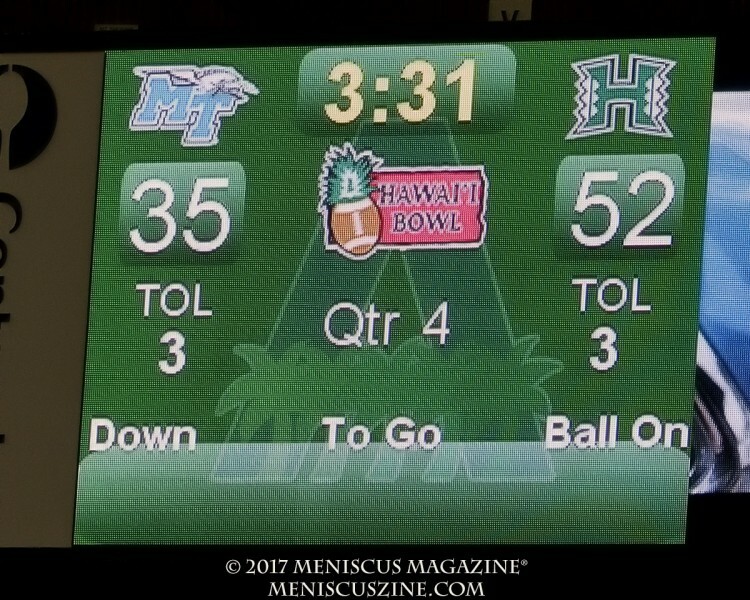 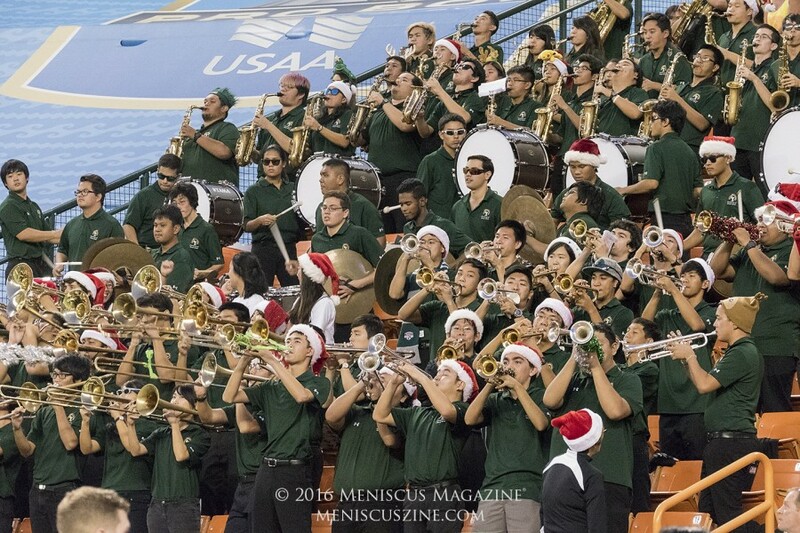 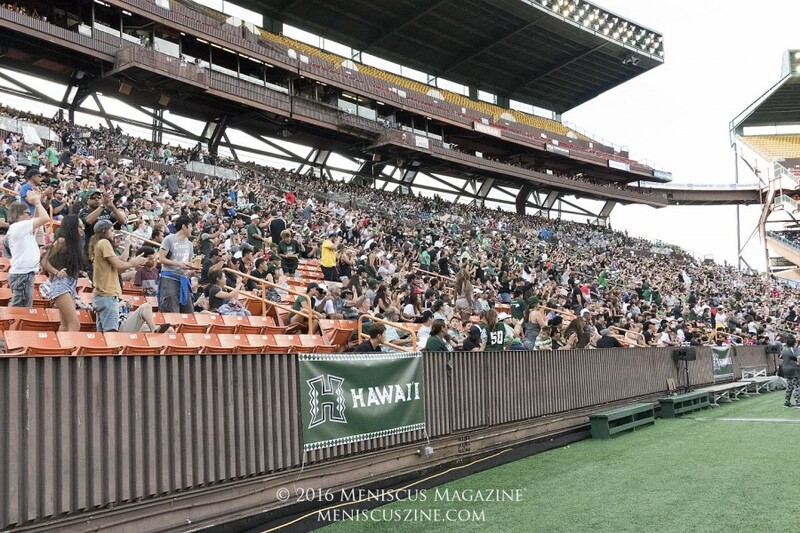 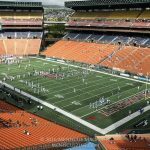 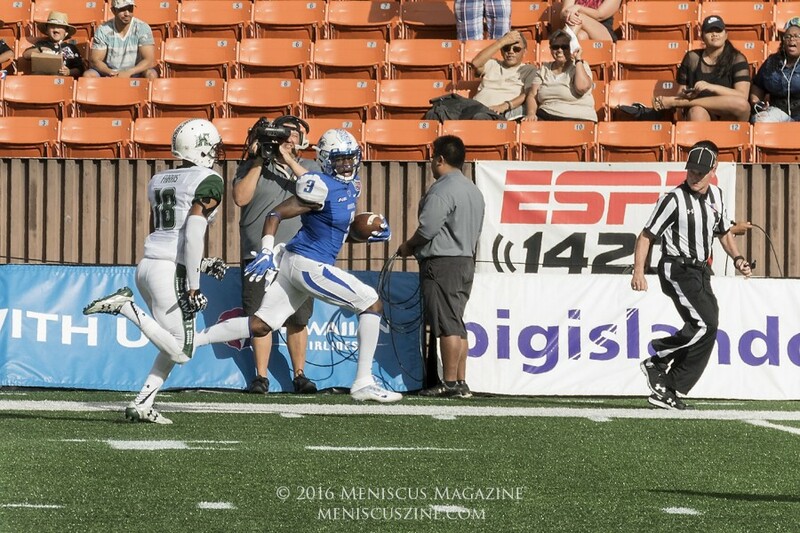 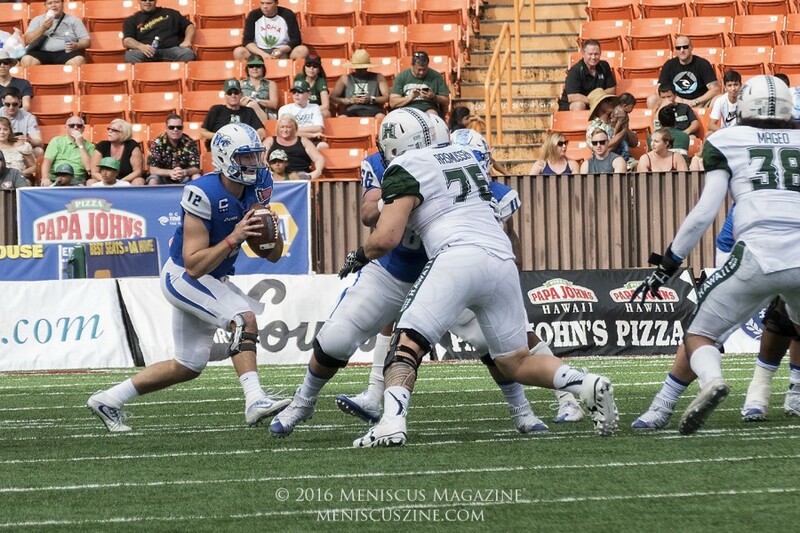 Dec. 24, 2016, Aloha Stadium – Needing neither approbation nor reprobation from the football gods, head coach Nick Rolovich of the University of Hawaii’s Rainbow Warriors used a “go for broke” strategy, overwhelming the Middle Tennessee State University Blue Raiders by a score of 52-35 to win the 2016 Hawaii Bowl. 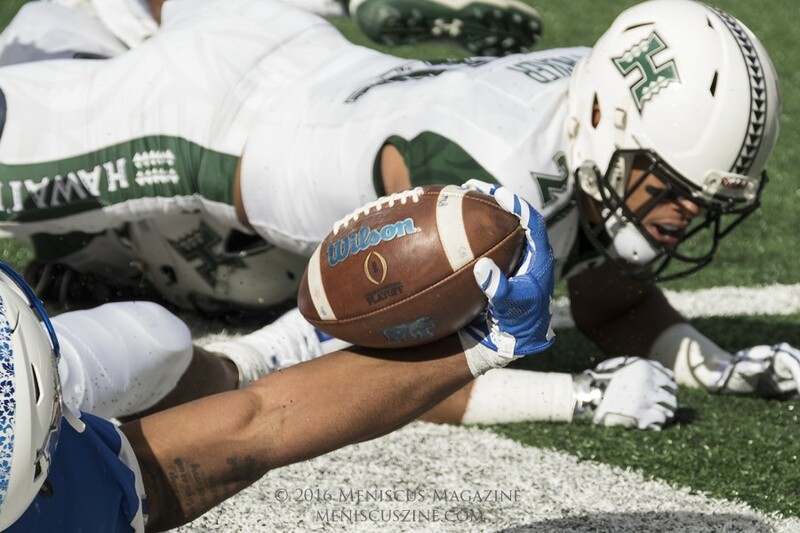 The game started rather ominously for the home team as the Blue Raiders took a 14-0 lead in just six plays during their first two possessions. 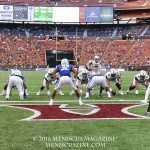 Before I could utter, “Wow, that was fast!” out of my mouth, the tide suddenly shifted both in efficiency and execution for the Warriors. 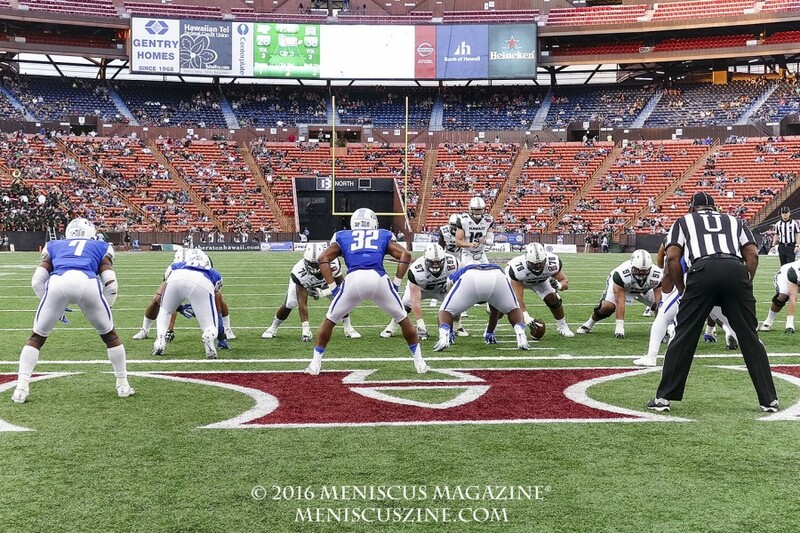 The avalanche started when Raiders quarterback Brent Stockstill was sacked and fumbled. 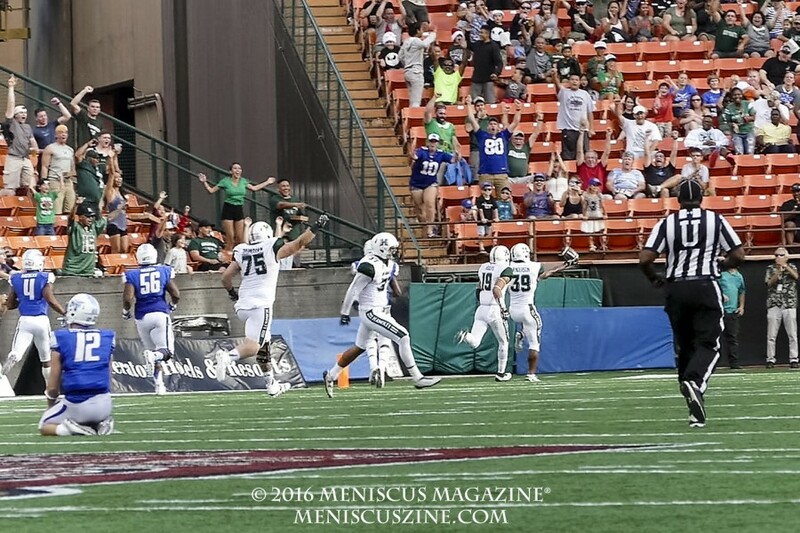 For the rest of the first half, the Warriors had six possessions and ended up scoring five touchdowns. 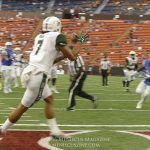 In those six possessions, they had the ball for a total of seven minutes and 40 seconds – gaining 268 yards in just 21 plays, or an average of 13 yards per play. 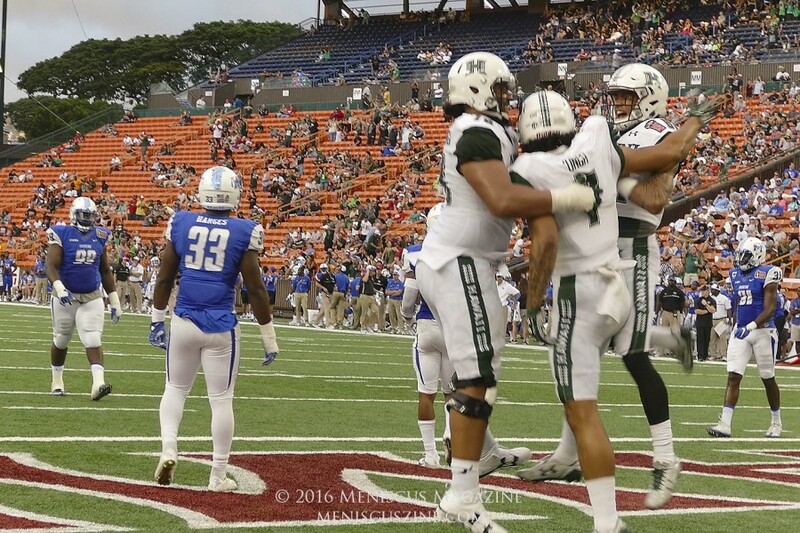 By the end of the half, the score was 35-21 in favor of Hawaii. 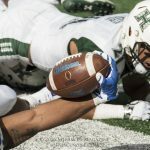 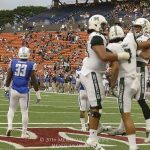 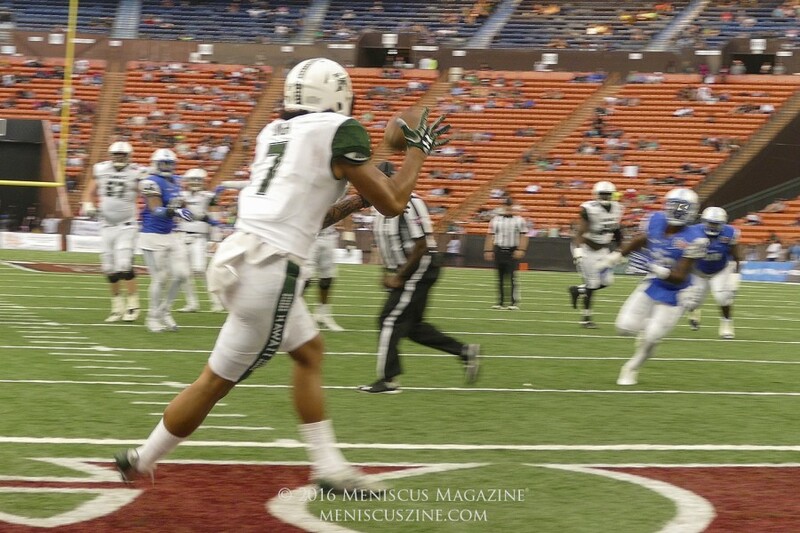 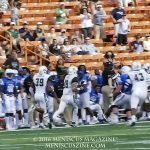 In the third quarter – and ahead by 10 points, 38-28 – on fourth down and 3 at Middle Tennessee’s 47-yard-line, Hawaii coach Rolovich decided on a fake punt. 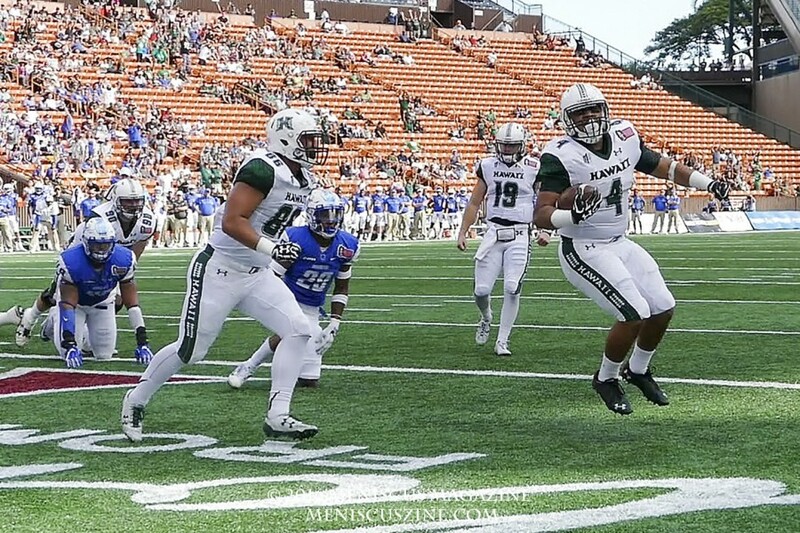 Wide receiver Makoa Camanse-Stevens was placed some eight yards to the right behind the punter. 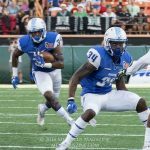 The snapper snapped the ball over the head of the punter, Rigoberto Sanchez, to Camanse-Stevens, who completed the pass to another wide receiver, Ammon Barker, for 21 yards to Middle Tennessee’s 26 for a first down…one of those “go for broke” plays. 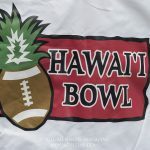 In that same possession, now fourth and 3 at the 19-yard line, instead of trying for a field goal, Rolovich had his quarterback Dru Brown complete a pass to wide receiver Marcus Kemp for 17 yards to the Middle Tennessee 2 for a first down. 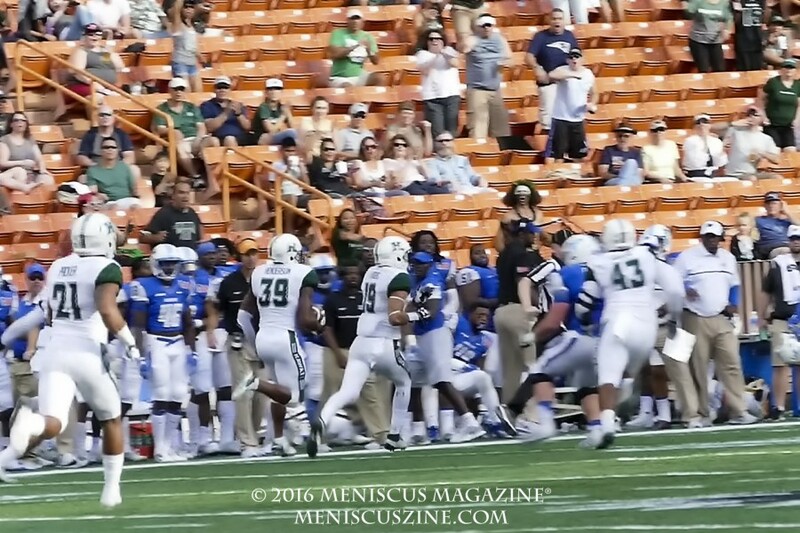 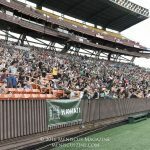 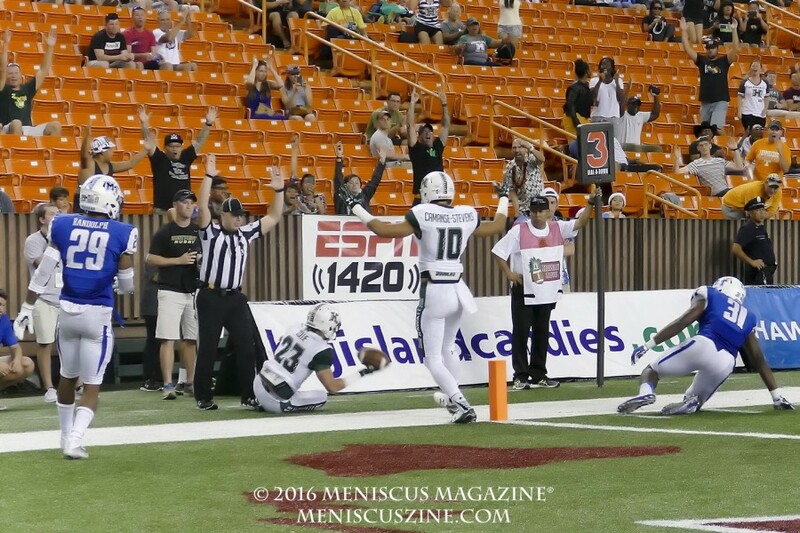 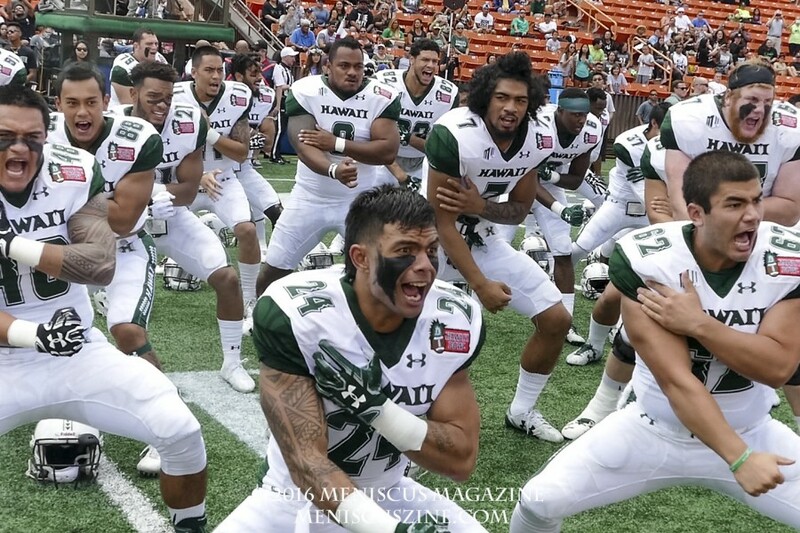 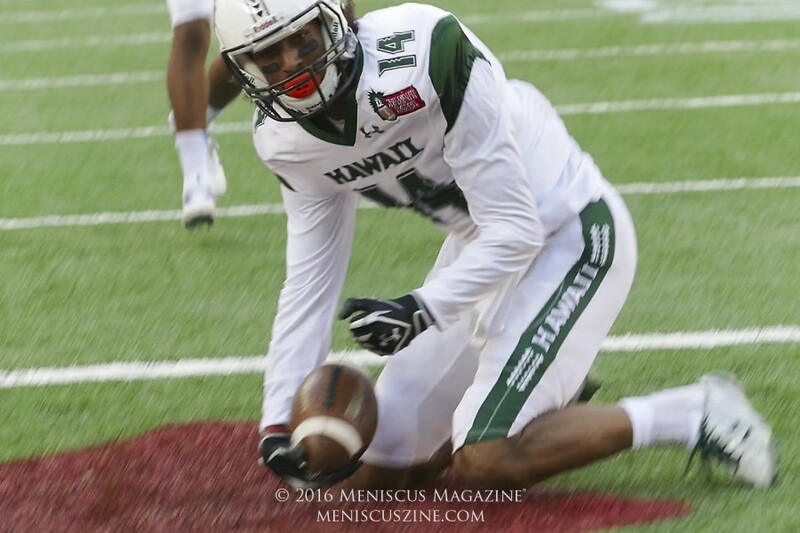 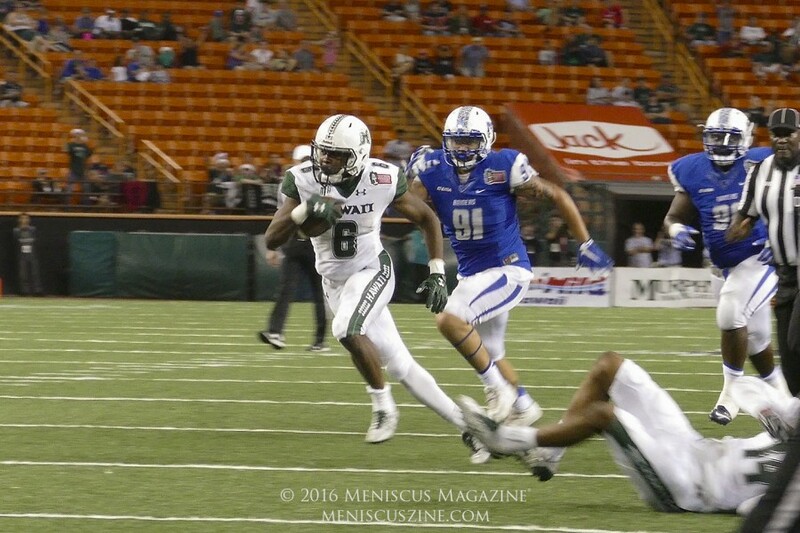 After a successful pass for a touchdown towards the end of the third quarter with Hawaii leading by 17, 45-28, the game was essentially over. 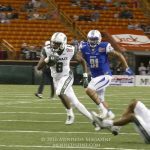 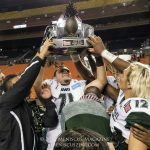 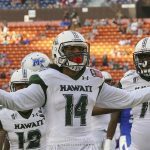 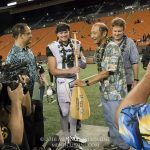 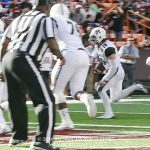 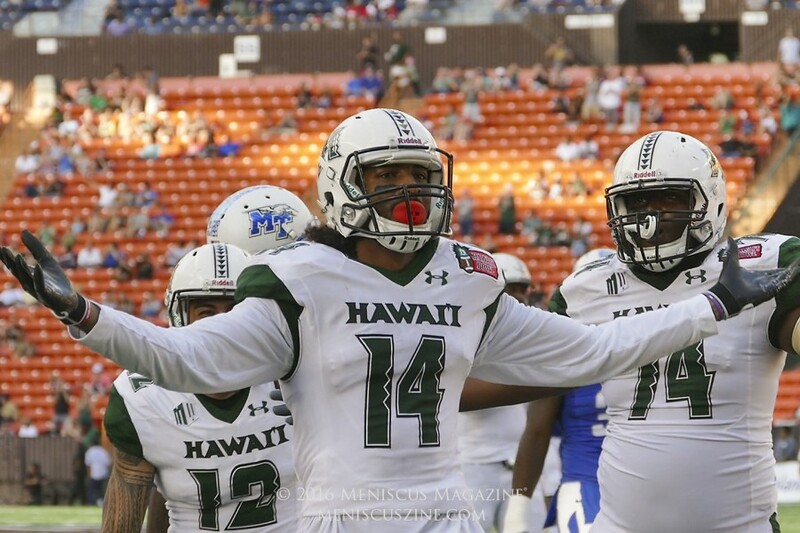 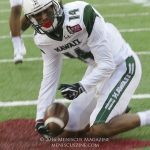 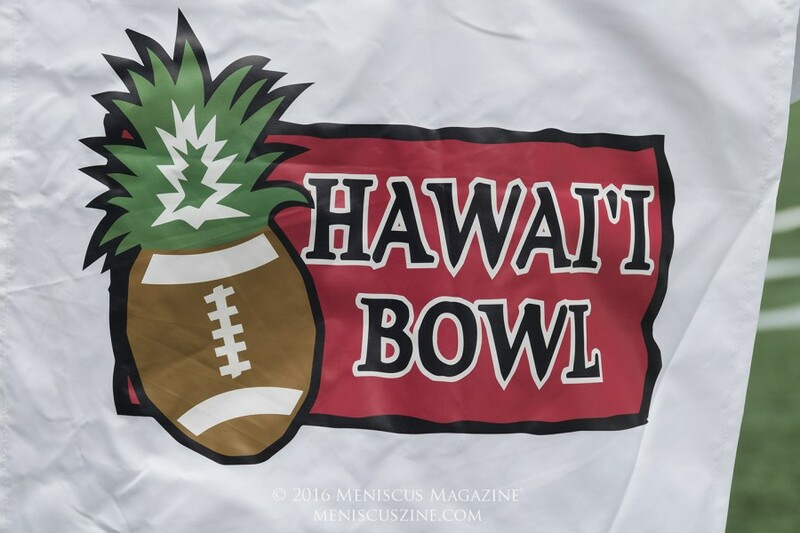 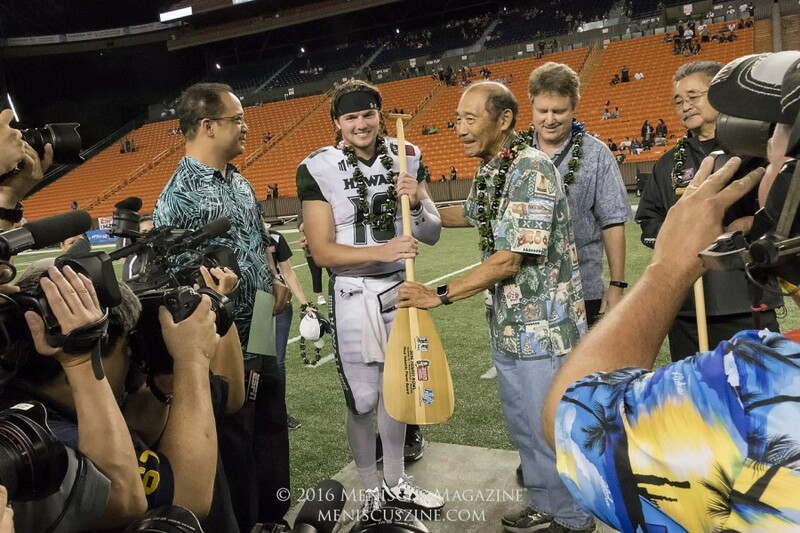 Brown, the MVP of the 2016 Hawaii Bowl, passed for 295 yards, completing 20 of 30 attempts, and finished with four touchdowns and no interceptions.. 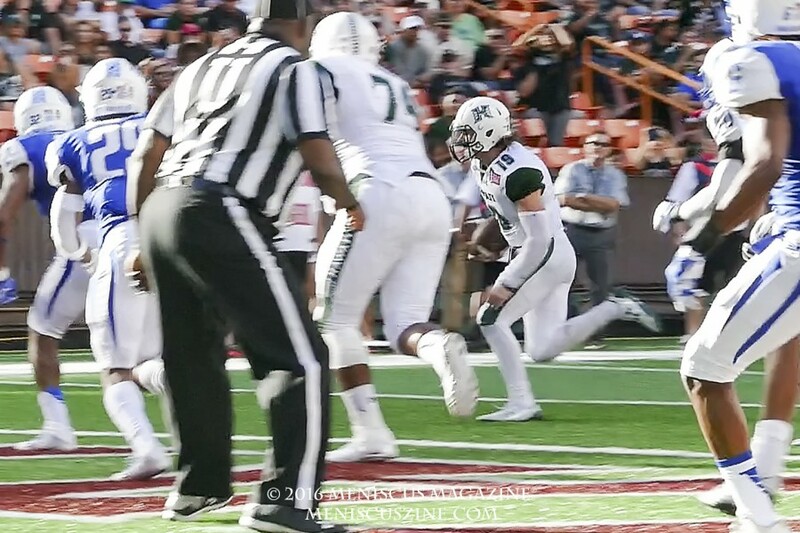 Wide receiver John Ursua had 120 yards in six receptions, and running back Diocemy Saint Juste had 170 yards with 25 carries. 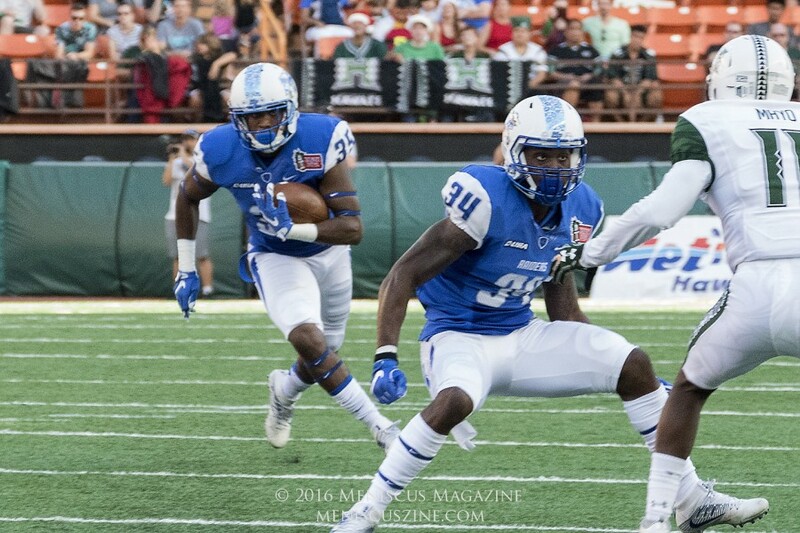 Middle Tennessee’s Stockstill had 432 yards in 30 of 51 attempts, with four touchdowns and two interceptions. 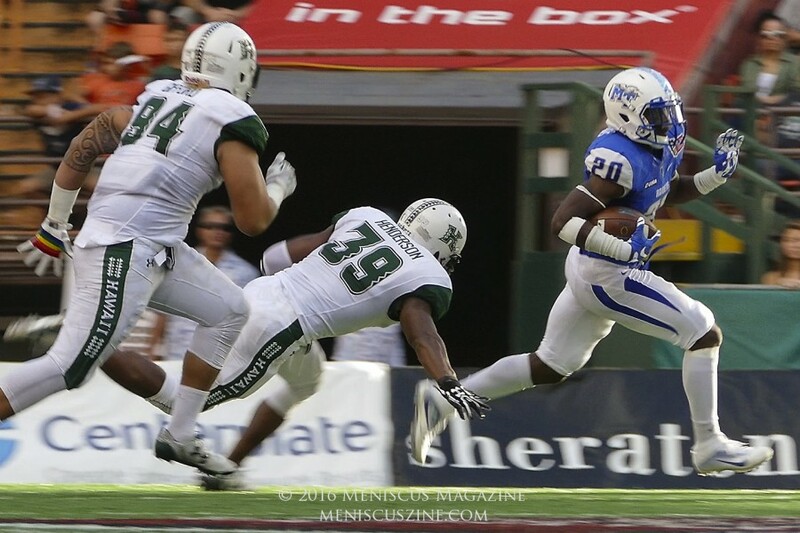 Wide reciver Richie James had 162 yards in eight receptions and one touchdown.